Australia’s collection of ‘big things’ is many and varied, with many interesting fun facts behind these structures. BIG4 Holiday Parks has done the hard yards unearthing some of the most entertaining for your travelling enjoyment. 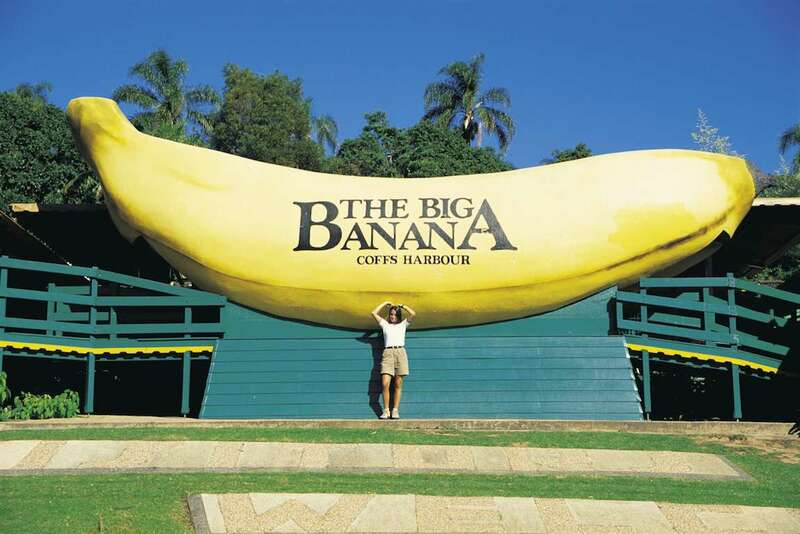 You’d be ‘bananas’ to think this giant structure is merely a quick stop-off point for a photo; instead, it’s home to an action-packed fun park and the chance to take a short tour of a banana plantation for an educational and entertaining insight into this popular fruit. See it when staying at Discovery Parks – Emerald Beach or NRMA Darlington Beach Holiday Park. Opened in 1989, the 9m-tall crustacean creation was ‘off’ for several years before gaining a new lease of life in 2013. Now secure in its home, it will whet your appetite for the abundance of delicious, fresh seafood that can be sampled throughout Ballina and surrounds. See it when staying at BIG4 Ballina Headlands Holiday Park. Imagine moving a 15m high, 18m in length and 97,000kg merino! That’s just what happened in 2007 as this 30-year old mega monument was relocated to its present site, where you can learn about the history of wool in Australia and even climb this big beast to soak up great views. See it when staying at Governors Hill Carapark. Unveiled by legendary musician, the late Slim Dusty, this 12m-high statue pays tribute to Tamworth’s billing as Australia’s country music capital. The on-site tourist complex includes a wax museum featuring country music royalty. Somewhat surprisingly, there’s also a museum with the largest privately owned collection of Sir Donald Bradman cricketing memorabilia. See it when staying at Paradise Tourist Park. 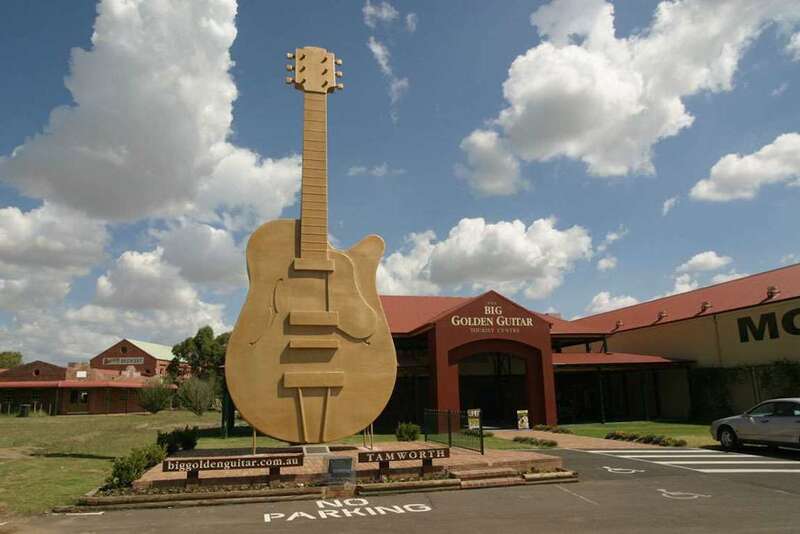 In Narrandera, the guitar theme continues thanks to the Big Playable Guitar which is located within the local visitor info centre, and where visitors are encouraged to strum a tune. See it when touring around central NSW. While this isn’t the most imposing of Australia’s big things, it is said to be the world’s largest bowl, weighing in at 2 tonnes. And if it inspires you, you can play with ease as it’s located right in front of the Lake Cathie Bowling Club. See it when staying at nearby BIG4 Bonny Hills Holiday Park. 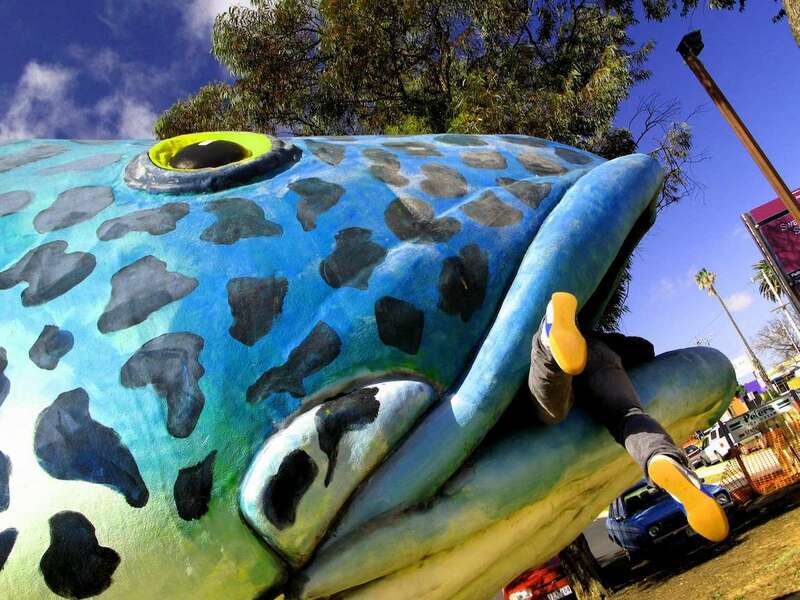 Trout fishing is a big deal in the Snowy Mountains region, so what better way to celebrate this than by creating a gigantic, fiberglass trout? Once the selfies are out of the way, head to Lake Eucumbene to try your hand fishing for rainbow or brown trout yourself. See it when taking a daytrip from Discovery Parks – Jindabyne. Since it opened 35 years ago, this sweet heritage-listed Queensland icon has hosted a stream of celebrities. As a must-visit tourist attraction, you can learn about pineapple farming, take a scenic train ride, and enjoy sparkling views from the observation deck. See it when staying at a quartet of BIG4 parks on the Sunshine Coast. This 10m-tall creation celebrates the region’s fine collection of mango orchards. Stop by this structure for a quick snap, then sample the to-die-for mango sorbet at the on-site visitor information centre. See it when staying at BIG4 Bowen Coral Coast Beachfront Holiday Park. Cairns has embraced ‘big things’ by creating two sizeable structures. The Big Captain Cook measures an enormous 14m in height and is in honour to the famous explorer who once visited these shores, while the 8m-tall fish statue celebrates the Marlin Coast, a stretch of coastline that starts south of Cairns and extends to Cooktown in the north. See them when staying at BIG4 Cairns Coconut Resort or BIG4 Cairns Crystal Cascades Holiday Park. There are more flightless cassowaries around Mission Beach and surrounds than anywhere else in Australia. If you’re having trouble spotting one, however, you can be assured you won’t miss this 5m-tall version at Wongaling Beach. See it when staying at Beachcomber Coconut Holiday Park. 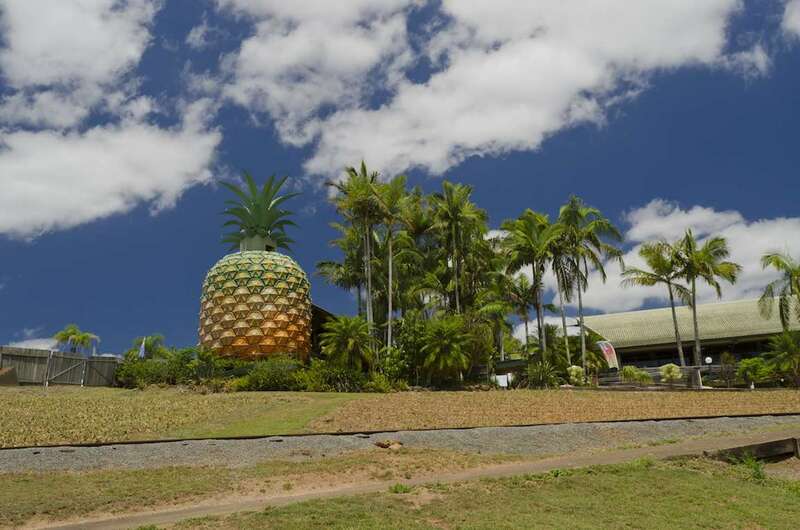 Tully locals have celebrated their claim to the title of ‘wettest town in Australia’ over nearby Babinda by erecting a giant gumboot. See it when staying at nearby Beachcomber Coconut Holiday Park in Mission Beach. Rockhampton regards itself as the Beef Capital of Australia and has stamped its authority on the title with the creation of six bull statues which are scattered around the vibrant city. 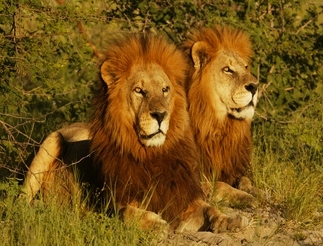 See them when staying at Discovery Parks – Rockhampton. 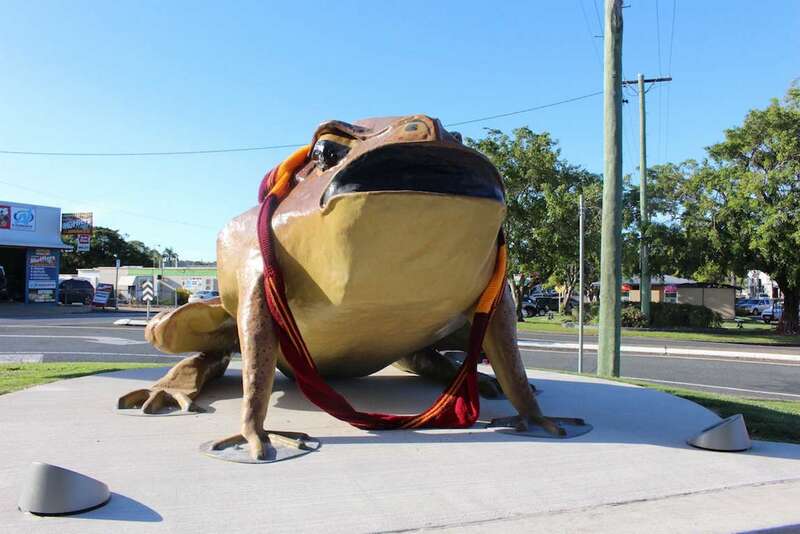 Sarina’s rich cane-farming heritage is recognised with a cane toad statue nicknamed Buffy. See it when staying at nearby BIG4 Mackay Marine Tourist Park or Mackay Blacks Beach Holiday Park. Is there anything more Aussie than a giant pie? One of Australia’s most famous pie shops, Yatala Pies, signals your arrival with a tribute to the humble Aussie pie. See it when driving between the Gold Coast and Brisbane. 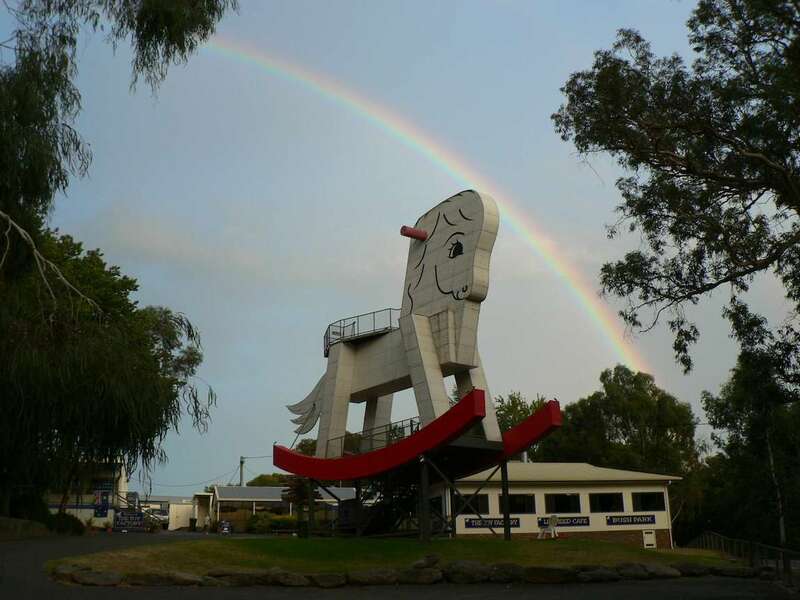 There’s plenty to keep families entertained at the Big Rocking Horse, including climbing atop this massive pony for sweeping views of the landscape, an on-site toy factory and the chance to feed the animals at the wildlife park. 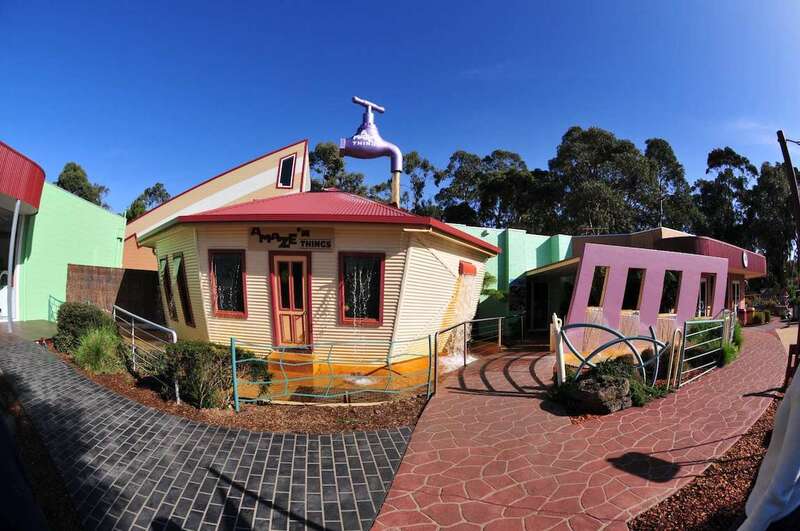 See it when staying at nearby Hahndorf Resort Tourist Park. The 7m-tall Map the Miner is a salute to Cornish miners who played an integral role in the development of the town. Sadly, this towering creation was damaged by fire several years ago, but has since been rebuilt. See it when on a daytrip from BIG4 Adelaide Shores Caravan Park or Marion Holiday Park. The Big Camera offers so much more than just a photo opportunity; within the structure is a top-notch photographic museum that retraces the history of photography, and it’s well worth a look. See it when you’re day tripping from Discovery Parks – Perth or Discovery Parks – Perth Vineyards. Created by the kids of the local community to serve as a reminder of the need to be aware of the presence of crocs in the area, this 20m-long ferocious creature should be enough to succeed in its aim. See it when staying at nearby Discovery Parks – Lake Kununurra. This 6m-tall boxing croc at Humpty Doo was built to celebrate Australia’s win in the 1983 America’s Cup. Sure, crocodiles and sailing boats don’t mix, but crocs and the Top End go hand in hand. 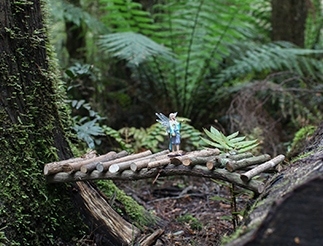 See it when staying at BIG4 Howard Springs Holiday Park. Murray cods are pretty big fish, but this enormous beast takes it to a new level. The giant 11m-long structure was once a prop in a film called Eight Ball; the locals like it so much they found a home for it outside the train station. See it when staying at BIG4 Riverside Swan Hill or BIG4 Swan Hill. This long-time fixture in the Grampians region may be the scariest koala in the area, but he’s not the only one. It’s worth a stop at the petting zoo, where the kids can pat native animals, farm animals and get up close with a koala. See it when exploring the Grampians region. The 8m-tall Big Miner is a tribute to the many prospectors who swarmed on Ballarat and its surrounds during the Gold Rush. What makes this such a tempting stop is the two themed 18-hole mini-golf courses on site as well. See it when staying at BIG4 Ballarat Goldfields Holiday Park or BIG4 Ballarat Windmill Holiday Park. What better to commemorate Australia’s most famous bushranger than to build a bigger, bolder version of him? This 6m structure of big Ned is located on the site of the Kelly Gang’s last siege. There’s plenty more bushranger history to soak up in these parts, too. See it when exploring Victoria’s High Country region. Phillip Island is home to a number of gigantic structures, including a worm, wave and cows. We’ve chosen the giant purple Big Tap because of the optical illusion effect of it seemingly floating in mid-air. See it when staying at BIG4 Phillip Island Caravan Park. While the town was named for the penguin rookery found nearby, the big statue was actually erected in honour of Penguin earning town status back in 1975. A bonus to this inviting location is the spectacular coastal vistas from the foreshore setting. See it when…staying at nearby BIG4 Ulverstone Holiday Park. The size of a real Tasmanian devil may be a bit underwhelming, particularly given their menacing title. The Big Tasmanian Devil is far more threatening than the real thing. 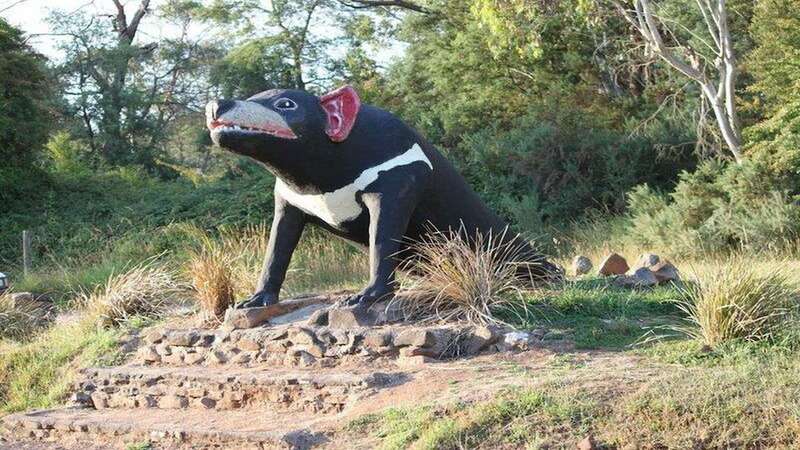 It can be spotted outside Trowunna Wildlife Park, where you’ll see proper Tasmanian devils and a whole host of other creatures. See it when taking a day trip from BIG4 Launceston Holiday Park, Discovery Parks – Devonport, or BIG4 Ulverstone Holiday Park. The massive stumps in this charm-filled English-style village are an ode to local cricketer, Jack Badcock, who was the first Tassie player to score a Test spot with Australia, and to notch up a century on the international scene. See it when staying at nearby BIG4 Launceston Holiday Park.